Healthy comfort food at its finest. 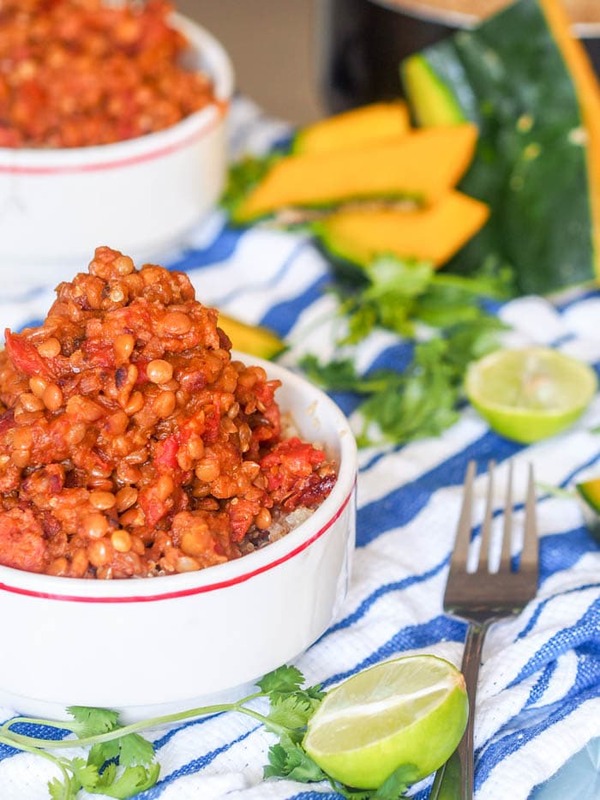 This dry sausage lentil stew with squash is perfect served over quinoa and makes for a high fiber and protein rich one pot dinner meal. Gluten Free and Dairy Free. Cooking and traveling don’t quite go together like bread and butter. Backpacks don’t make for the best kitchen cabinets and rental apartments in Peru don’t exactly carry food processors, dish washers, blenders, and all other high tech beloved kitchen gadgets. (For those of you not in the loop, I’m currently backpacking across South America with my boyfriend, D). You just have to make do with what you have. And sometimes that is simply a stove, one pot, one pan, a few odd pieces of cutlery and one dull knife. Aaah the dull knife. Nothing upsets me quite like a kitchen without a single newly sharpened knife. The cooking must go on though. So when I’m grocery shopping while traveling I try to be as inventive as possible – coming up with multiple different recipes using pretty much the same ingredients. I try to buy in small quantities so I can use everything up within a few meals. Or if I don’t, I end up carrying around a bag of lentils and quinoa in my backpack for weeks at a time, and when you’re carrying that bag on your back every ounce counts. So that bag of quinoa first got applied to a big batch of vegan country squash quinoa soup and now was ready to be the base for a dry sausage lentil stew with squash. Squash, or more accurately pumpkin is readily available in all grocery stores and markets in Peru and has become my new favorite ingredient to cook with. I dice it up or grate it (when the apartment is highly equipped it comes with a grater) and add that to everything. The grated squash, when it cooks up, adds a light creaminess to the dish as the shreds of squash seem to dissolve completely and simply leave behind that lightly sweet creamy flavor with a creamy texture. Aside from the quinoa that gets precooked, everything else here cooks in one pot in stages. I love preparing meals like this because as one ingredient cooks you can prep the next and so on. No need to have everything chopped up when you start cooking. For this sausage lentil stew start browning the sausage and then chop the onions and garlic, grate the squash and dice the tomatoes. Eventually everything gets tossed in and nicely browned and then we add in the liquids – a bit of white wine and then water or broth. Let everything simmer, covered over low heat until the lentils are cooked through. Add more water as needed or if you want a more liquidy consistency. I was going for more of a dry stew so I let the liquids cook off, but this is entirely up to you. Add a ton more water and you’ll have yourself a lentil sausage squash soup instead (not a bad idea either). 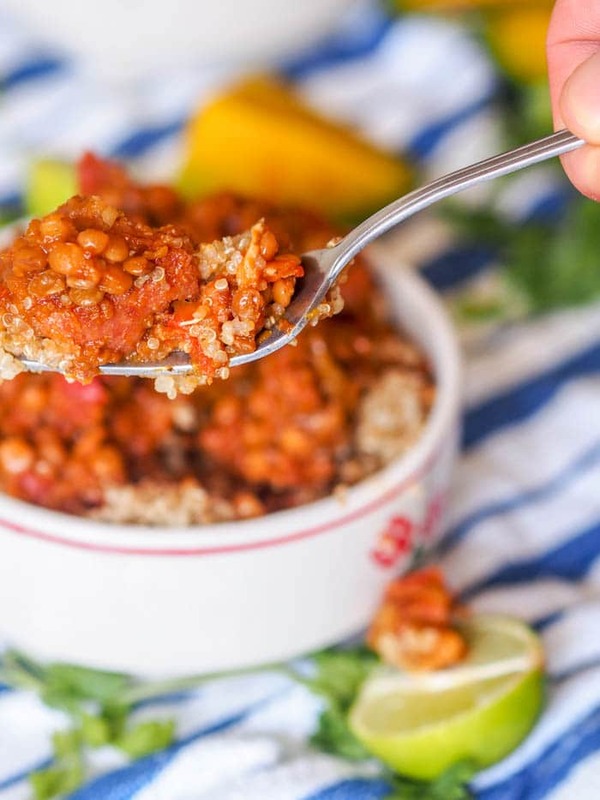 Serve this sausage lentil stew with squash over quinoa with a drizzle of lime juice and fresh cilantro. A super creamy and rich comfort meal perfect for the still cooler spring days. Healthy comfort food at it's finest. 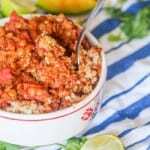 This dry lentil sausage stew with squash is perfect served over quinoa and makes for a high fiber and protein rich one pot dinner meal. Gluten Free and Dairy Free. Cook quinoa according to package directions (optional). Heat oil in pot over medium-high heat. Add sausage and cook until browned, breaking up the sausage into smaller pieces with a spatula. Add red onions and garlic and cook for a few minutes. Add squash, cumin and salt. Cook for a few minutes. Add tomatoes and lentils. Cook for a few minutes. Add white wine. Bring to a boil. 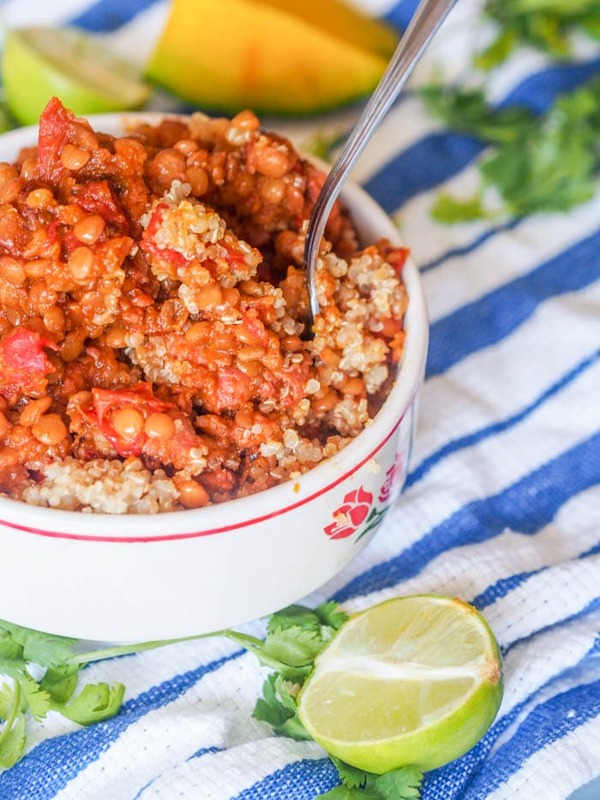 Serve over quinoa (optional), garnished with chopped cilantro and lime juice. I bet this is so filling with the lentils and quinoa! It took me a couple time to get used to the texture of quinoa, but now I love it. Going to try this for sure! You had me at lentil stew. This looks so creamy and delicious!!! YUM! This looks delicious, but would be SOOOO much better while traveling through Peru! So lucky! Oh, my, I love pretty much anything you can do with lentils and sausage – they go so well together! With the pumpkin as well? Lovely. And I’m laughing (sympathetically) about the not-sharp knife – I traveled around Europe with a bread knife in my backpack! Yes the pumpkin fits in perfectly with the lentils and sausage. Haha yes – glad to hear you also travel prepared, with utensils! This lentil squash stew looks delicious! I make lentils a lot but have never made them with sausage, great idea!! Thanks! The smoky sausage works perfectly with the lentils!